This is the most difficult blog post I’ve ever written. Because it is painful. Because it is personal. But it is also precious, and I serve no one by sitting comfortably in my silence. You will be blessed by this story. Thursday we said goodbye to a member of our family. Brian is the husband of David’s sister Dana, the father of Rian, Rhea & Reid. It was the end of a five year battle with melanoma. It was one week after we all sat as a family around the Thanksgiving table. 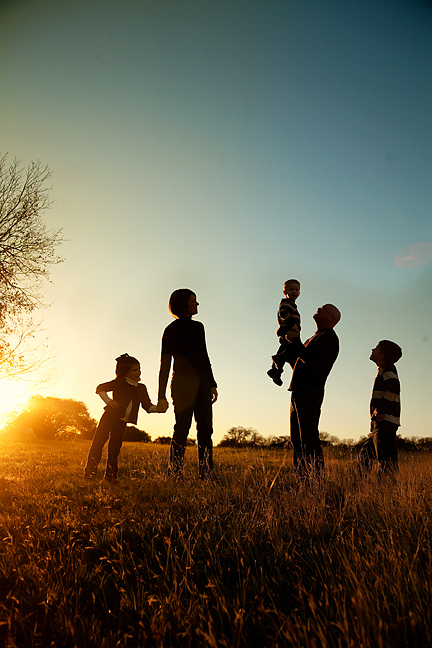 It was one week after we spent a peaceful evening taking family pictures in a wide field at sunset. It’s difficult to take it in… how someone can be here, and then gone so suddenly. We spent this past week in Texas, as Brian’s journey on earth ended and another in heaven began. I won’t talk about the disease, because although his battle was valiantly fought and his quiet strength amazing, that’s not what his life was about. His life was about the people he loved. And they loved him. Over 500 people stood for an hour or more in the cold drizzle in line at the visitation. Over 700 people crowded in, standing at the back and in the foyer of the church for the funeral to celebrate his life. The funeral procession was the longest I’ve seen, weaving through his small town, passing by policemen and firemen beside the road, their hats in their hands in respect. It is truly amazing to see how many lives one person can touch. Perhaps what amazes me most is Dana. Many of you received the emails she sent throughout Brian’s long battle. Her courage and strength were evident, but it was her faith, even in the most dire circumstances, that made me proud to call her my sister and my friend. Her story with Brian is a rare one. They were first love. They were the only love for each other. They were best friends. With one another they were pure and deep and real. They held each other in the highest regard, both publicly and privately. I never heard either of them ever say a negative word about the other. They had hundreds of private jokes and hilarious stories between them. I know about ten, and would get in big trouble if I posted them here. I guess what I’m saying is that they already had the kind of marriage that most of us aspire to. Dana floored us all when she got up to speak at the funeral. To me that action spoke to the amazing love she had for Brian. She pushed aside any fear or grief that she was feeling at that moment so she could honor him in a way that was so loving. He would have been so proud. Actually, I’m sure he is. After our photo session, I asked Dana privately, “How did you make it through this today?”. She paused and replied, “Because I know God is going to take care of our family.” And He will. He is. Even in the midst of great heartache. Especially in the midst of great heartache. We would appreciate prayers for Dana and her family… for the peace that passes understanding, for hearts to begin to heal, and for memories of this wonderful man to remain strong. Whitney, I told you how much I appreciate your photography, but what I didn’t take the time to say was how rare it is to find a photographer that also has a gift of words, or a writer that has such a gift of photography. Either way, thank you for sharing both of your gifts to honor such a precious family. I’m blessed to have known Brian, and inspired by Dana in her faith. I am so sorry for your loss. What a beautiful post. Whitney, I am sorry for the loss that your family has endured…but what a blessing, too. Such a beautiful story must be shared. And what an awesome picture as well. My sweet Scott family- words cannot express my deep sorrow that I feel for you, Dana, the precious children, and all of the people that Brian touched in his life. What an amazing man he must have been. Thank you for sharing him with us. Whitney, what beautiful words. I know that Dana and Brian and the kids would be and are going to be filled up by them. What a beautiful picture as well. I am astonished by Dana’s strength and I think you captured it here beautifully. So sorry for your loss! ‘Bittersweet’ does not even begin to describe this picture… My thoughts and prayers are with your family. Whitney and Dave Life is Fragile….Handle with Prayer comes to mind when I read your sincere words….and that picture..”Oh” that picture, one of your finest. What a treasure that picture must be to Dana. How quickly our whole world can change. You’re truly an artist with your camera as well as your pen. Our prayers continue for Dana and the kids. Our thoughts and prayers will be with you and your family. What a nice post you have written about your loved ones. I always love to read your items you have to share. Thanks for sharing Brian with us, sounds like an amazing person, father and husband. Love the White and Scott families and continue to pray, and mourn, and celebrate, and remember, and all kinds of mixed feelings. This is a great gift of words for those of us who don’t know how to say the things on our hearts. We continue to lift all of you up.